The thing that I love about Navaratri is the arrangements of dolls in steps, called as Gollu. I know people love to participate in Gollu competitions. It is really fun to watch. Once happened in my colony in India. We had Navaratri celebrations and Gollu competition was the highlight. Judges will be going from house to house checking for the Gollu arrangements. I will write more about these competitions tomorrow. Now coming to day 2 of Navaratri. Today we worship Badrakali, another form of Durga. Remember? the first three days of Navaratri are about Durga! Today's prasadam or neivedyam is Pattani/Peas Sundal and Ladoo. If you are using fresh peas, then pressure cook it for 2 hisses. If you are using the frozen peas then boil it for 2 min. Both ways add a pinch of salt while cooking t he peas. Do not over cook the peas. In a pan, add oil, mustard seeds. When it pops add hing powder. Add the urad and channa dal and saute. Add curry leaves and green chillies. Now add the Peas/Pattani and mix well. As the peas is already cooked you need not cook the peas at this stage. Now add the shredded coconut and add check for salt. If needed add some more salt. Your Pattani/Peas Sundal is ready. This sundal is famous in Indian Beaches. They add some finely chopped mango to this and also add red chilli powder to spice it up . I am literally drooling just by this thought! It is called Thenga (coconut) Manga(Mango) Pattani (Peas) Sundal! Now for today's sweet. I am proudly sharing the king of sweets, Ladoo as today's Navaratri special sweet. Check out my Day 1 Prasadam/Neivedyam for navaratri. Catch you tomorrow with more Sundal, sweet and Navaratri gossips! this is great :). Thanks for posting this durgaji idol. I m missing that now. 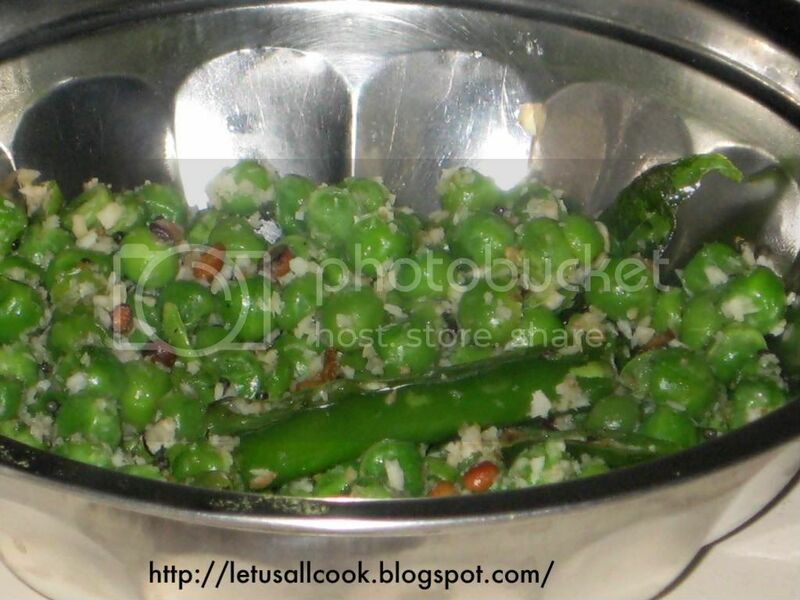 Peas sundal and laddoo looks yum, Sangeeth! !